If you’re not sure what capacity you need or you just want to learn more about bulk coffee makers in general, read on! 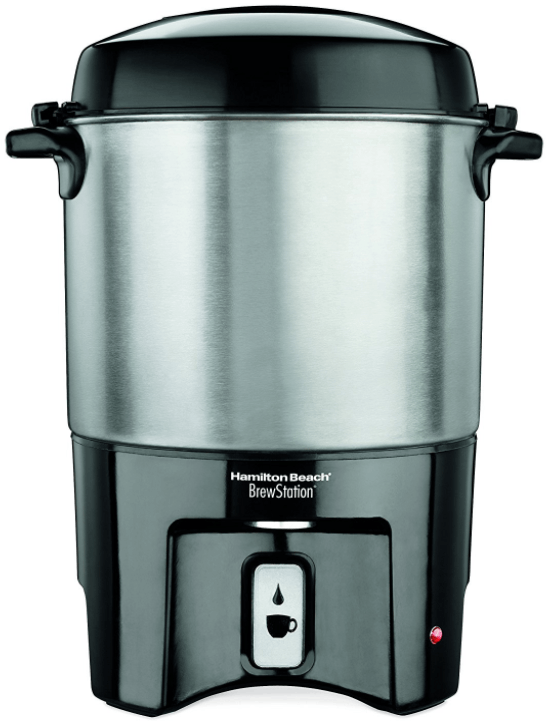 Choosing the appropriate coffee urn is actually pretty easy. There are three main things you should consider before buying: Capacity, the heating system, and whether or not you’ll need paper filters. This is very straightforward – how much coffee do you need to make at once? The larger the urn, the less often you’ll need to brew fresh coffee. A good way to estimate is to count up how many people you want to serve, and then assume each person drinks 3 cups of coffee throughout the day. For example: If you’re buying a coffee maker for a 10-person office, you should be fine with a smaller 30-cup unit. When we say “heating system,” we’re talking about what happens after your coffee is done initially brewing. As in, how does the coffee stay hot, and for how long? An active heating system: These keep your brew at an appropriate serving temperature for as long as the unit is plugged in. A passive heating system: These conserve heat for as long as possible, usually through some sort of insulation like you’d find in a thermos. Active heating systems tend to be slightly more expensive because you’re paying for a more robust heating element, and because they use more electricity. 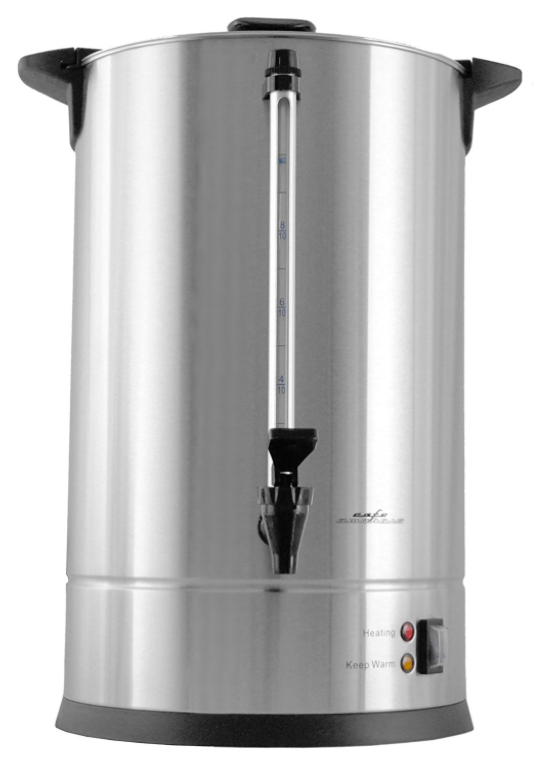 Whether you actually need an active heating system depends on why you’re buying a coffee urn in the first place. If you’re going to use it for day-long events, we do recommend purchasing a unit that has some sort of active heating element. Otherwise, your brew will end up tasting lukewarm and stale, and you’ll likely have to brew a new batch before the first one is entirely gone. On the other hand, if you’re buying an urn that just gets pulled out for shorter events like the occasional meeting or presentation, you should be fine with one that’s just well-insulated. Most modern coffee urns do not require a filter. Instead, they come with a plastic or metal filter-basket that you can put your coffee grounds into directly. That being said, these units do recommend you use larger, more coarse grounds in your brew. Finer grounds might pass through the built-in filter-basket more than you’re used to. If you find your grounds ending up in the coffee more than you’d like, you can use paper filters in most coffee urns. You’ll probably have to buy larger filters, but they also don’t have to be an exact fit. If you have to fold or even cut your filters in a certain way to fit the urn, there’s nothing wrong with that. If you’re just looking for a mid-sized coffee maker that can handle 30 cups at once, this West Bend model is perfect. It heats up quickly with a brew speed of 1 minute per cup of coffee, and keeps coffee at serving temperature as long as you keep it plugged in. The central container has water level markings for easy filling, and all plastic components are heat-resistant to minimize accidental burns. In general, 30 cup urns are great for smaller offices, half-day presentations, and even for volunteers working something like a race, charity event, or voting booth. 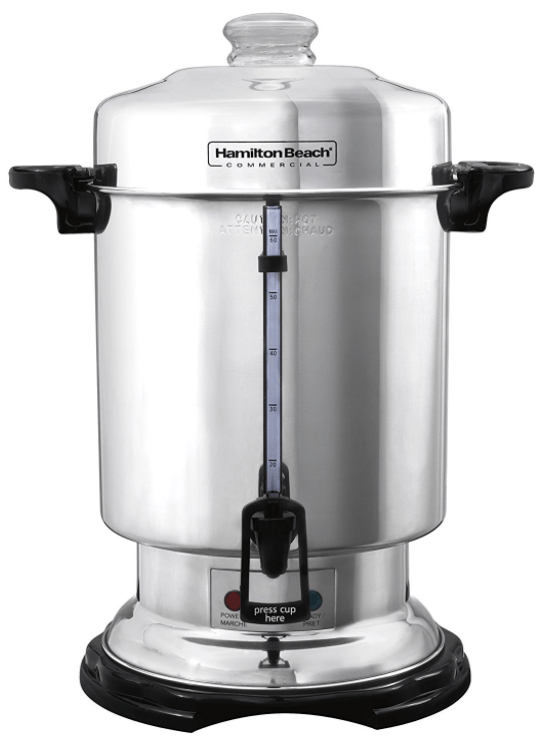 The main thing we like about this 40-cup model from Hamilton Beach is the dual-heating system. Once your coffee is done brewing, a secondary heating source kicks in that keeps your coffee at the perfect serving temperature, without burning it. To put this to the test, we brewed up some coffee and then compared cups immediately after brewing and 5 hours later. The coffee tasted exactly the same, with none of the staleness or burnt flavoring you often get with coffee that’s been out all day. 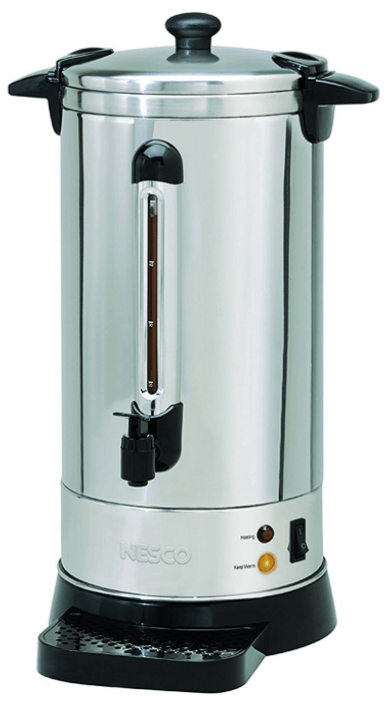 Nesco put together a great stainless steel urn here. It brews one cup per minute, and it’s double-insulated to keep your coffee at serving temperature as long as possible (along with a “keep warm” setting). It comes with a handy little drip tray to prevent damaging the surface it’s on, as well as “stay cool” handles and a locking lid. We really like the aesthetic of this Hamilton Beach model. It’s stainless steel body look very elegant, but it’s also a very affordable option. It brews at the standard one-cup-per-minute rate, and has a very good “keep warm” setting that keeps your coffee fresh for hours after the initial brew. The handle choice they went with is pretty neat too. It’s a one-hand dispensing system that really cuts down on accidental drips and drops all over your tables. This maker really is the best of the best – it’s just overkill for anything less than commercial events or larger offices. We’ve had it brew 100 cups of coffee in 30-45 minutes, which is absolutely incredible when compared to most other units. 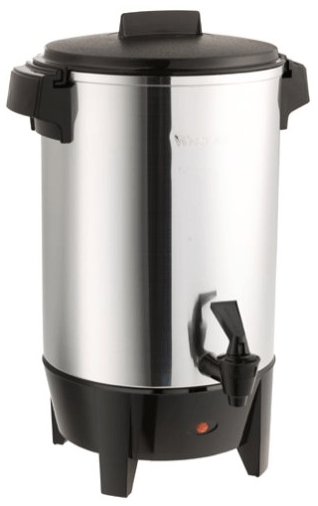 Everything else is quite standard and very high quality: A double-wall stainless steel body, dripless faucet, extra drip tray included, and anything else you’d want out of a coffee urn.